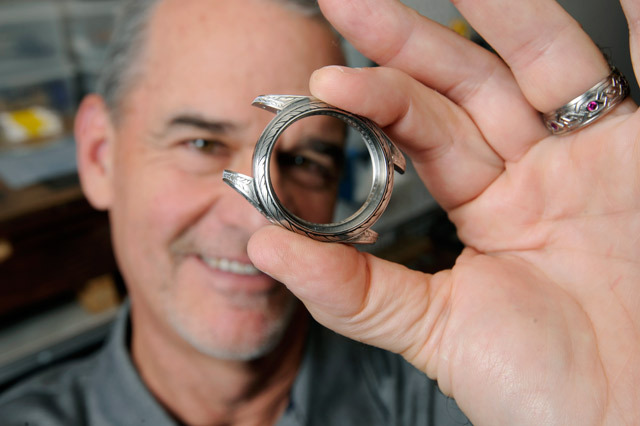 <b>METAL MASTER: </b>David Sheehan creates intricate and whimsical designs for everything from rings to knives in his Mission Canyon home studio. David Sheehan’s Mission Canyon engraving studio feels a long way from corporate America. Perched high on a small road of big houses, Sheehan’s upstairs office is where he draws intricate patterns that seem both traditional and freshly minted at the same time. 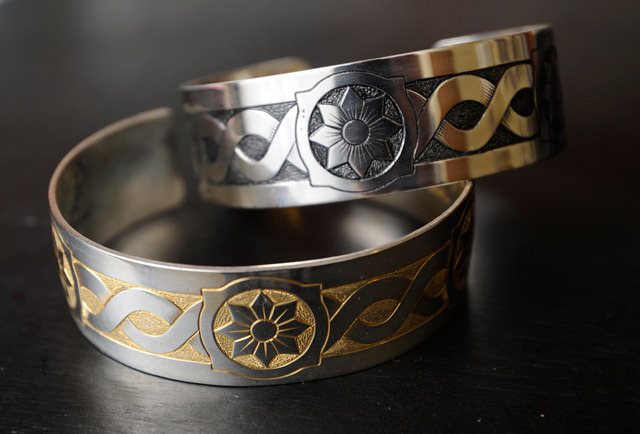 Downstairs in his garage, he turns those drawings into precisely executed motifs, emblems, and flourishes on gold, silver, platinum, and even stainless steel — one of the hardest of metals to hand engrave. The tools of his trade, a “dying art” as he terms it, are both old and new. Though much engraving today is done with lasers directed by software, Sheehan works deep in the metal with his two hands, and each motif is done separately. Aided by computers and microscopes, Sheehan’s hand engraving is done with a blade that electronically vibrates enough to cut into metal, but the hand has to be true. While watching him cut a piece of fine metal, I marvel that his hand never slips. “It does sometimes, but to tell you the truth, I’m more steady engraving than drawing,” he said. He’d been a precision welder when young, but he didn’t want to go that route. “Engraving just sort of caught my eye,” said Sheehan, who, after a lightning-fast apprenticeship, began engraving bowie knives, Snap-on tools, Harley-Davidson parts, and even personalized pocket knives as groomsmen presents.